YesButNoButYes: Chips. They're what's for dinner. Chips. They're what's for dinner. Visited your local supermarket lately? 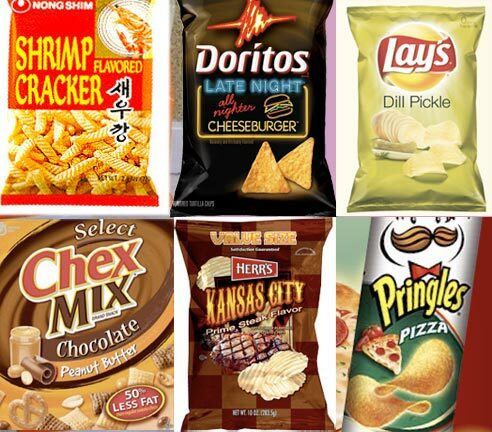 Take a stroll down the snack food aisle, you might be surprised at the flavors being introduced and marketed. Cheeseburger. Pizza. Steak. Pickle. Crab. Shrimp. Okay Frito-Lay, am I eating a chip or a chemically-made flavor substitute for dinner? The juries out for now. But the way it's going eventually everything we eat will be duplicated in chip form. That's just a stupid theory, but one snack companies seem to be making good on. Meanwhile, the fat keep getting fatter. Those dill pickle chips are the business. As they would say in France - C'est Vraiment Scrump-diddli-Umptious! I was in Vancouver a couple of years ago (that's in Canadia btw) and they had Curry flavored potato chips there. Also very cool. said E on April 16, 2010 2:23 PM. Protip- Crab Chips are not actually made to taste like crab. They just have the same seasoning you put on steamed crabs, Old Bay. And they are Delicious. said tharrison06 on April 16, 2010 2:39 PM. Crab, fine. Shrimp then. Jez. said Baierman on April 16, 2010 3:27 PM. My fave chips are sour cream and sweet chilli. said Evangeline on April 16, 2010 5:12 PM. Chemicals are delicious. I don't care if my chromosomes mutate, I want my Cool Ranch Doritos Damit! said LightsOut on April 16, 2010 5:57 PM. Shrimp chips can be yummy. Especially the spicy Asian varities. said nihil on April 16, 2010 7:07 PM. We in Canada have had Dill Pickle chips since before I was born. And Ketchup. Ketchup chips are the best. said Landon on April 16, 2010 7:36 PM. Over here in NZ we have some 'Kiwi As' flavored chips. There is Tomato Sauce, Onion Dip and and Mainland Cheese. They are pretty fucken random. said Frank the Tank on April 16, 2010 7:42 PM. I had a bag of red wine potato chips (or "crisps") from Marks & Spencers in England a few years ago. Mighty tasty ... so much so that I had a friend pick up several bags for me when she came back to the States. said Echowood on April 16, 2010 8:48 PM. said Baierman on April 16, 2010 11:08 PM.